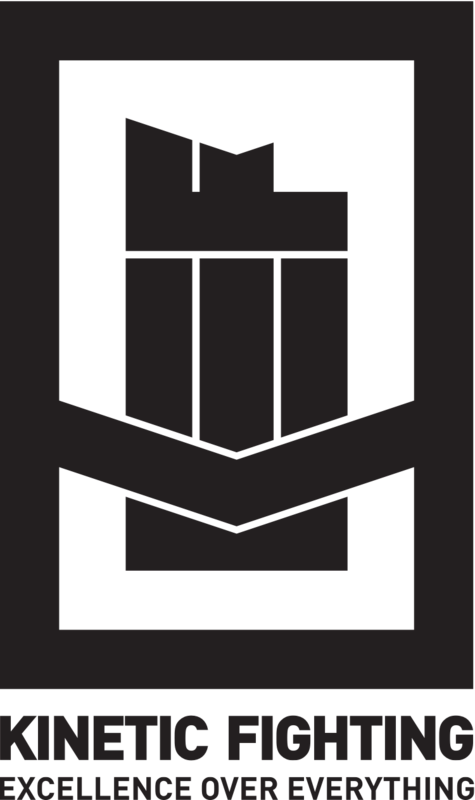 Kinetic Fighting–Integrated Combat (KEF–IC) is a system of mental and physical training, designed to instil a survival mindset while developing the skill sets to support it. In this and many other ways, it reflects the Australian Defence Force system to which it is aligned: the Army Combatives Program, or ACP. KEF–IC courses focus on principle-based learning to facilitate faster uptake and flexibility in application, so our trainees get the most value out of every short course. Our instructors’ mission is to provide you with the framework and understanding needed to develop the skills taught, as well as your existing skill sets, for effective application in close combat. Kinetic Fighting was first developed to keep soldiers alive in war zones. So, even though the KEF–IC program is tailored for use in an everyday setting under common law, the goal of the training is the same: survive, no matter what. Who Can Train in KEF–IC? 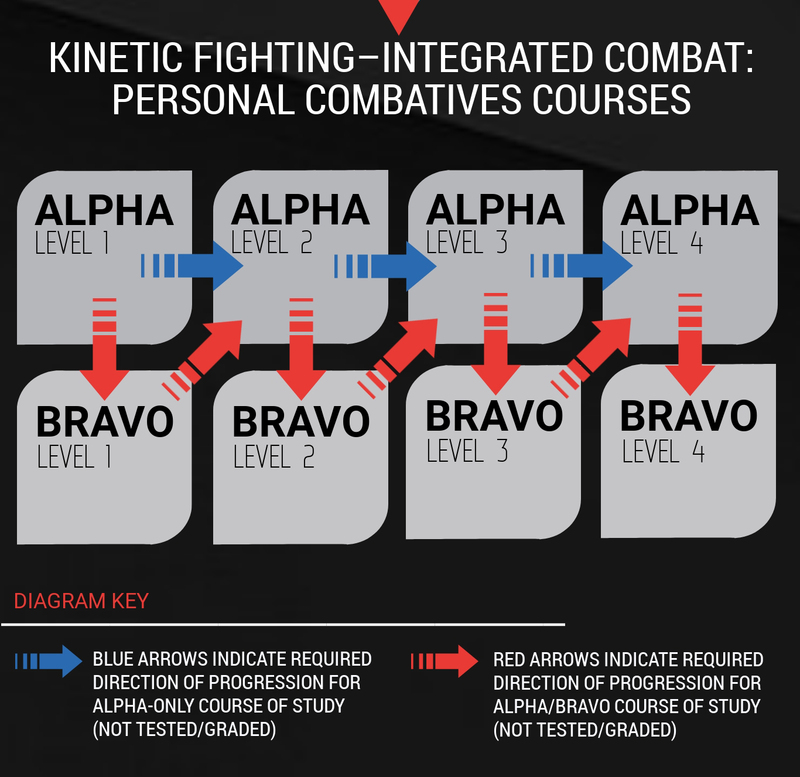 Replacing Kinetic Fighting’s previous P1–4 course modules for non-military personnel, KEF–IC training became available to the public for the first time in October 2018. It is designed for everybody, from professionals who deal with violence at work, to those who just want to feel safer on their daily commute. KEF–IC principles do not discriminate against the out-of-shape, physically challenged or inexperienced. They work because they are tactically and physiologically sound. If this is your first foray into studying self-protection, KEF–IC courses will teach you the essential principles and key techniques needed to build your capability from foundation level. Through ongoing training and progression through the KEF–IC modules, you will acquire a solid arsenal of battle-proven combative skills and tactics that can be applied under extreme pressure. For seasoned martial artists and front-line professionals, a KEF–IC course will not only expand your repertoire of self-defence strategies and techniques, but give you the means to train them. The drills and applications learned will enable you to develop and test useful supplementary skills, as well as enhance your current abilities. As with everything we do in Kinetic Fighting, your desired ‘end state’ will determine the path you take. 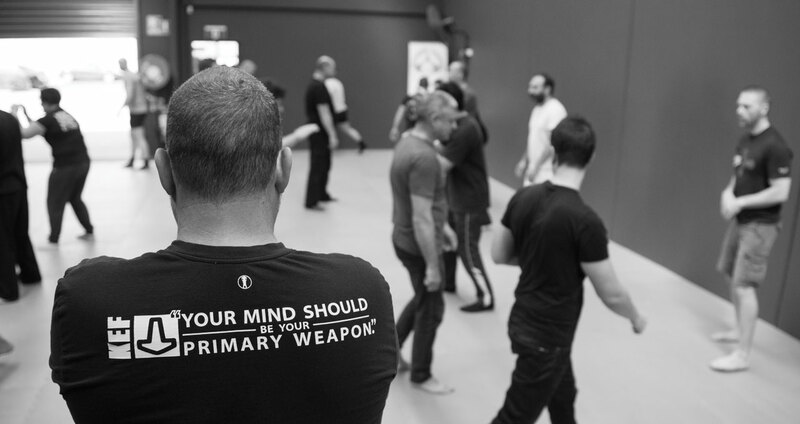 Maybe you just want to learn mental strategies and tactical applications to make your existing martial arts skills more effective? Or, perhaps you want to dive right in and take your first steps toward a KEF–IC black belt? Either way, the place to start is with the KEF–IC Level 1-Alpha course — no prior training required. Suitable for both front-line professionals and raw beginners, Level-1 Alpha is a mix of theory and hands-on practice. 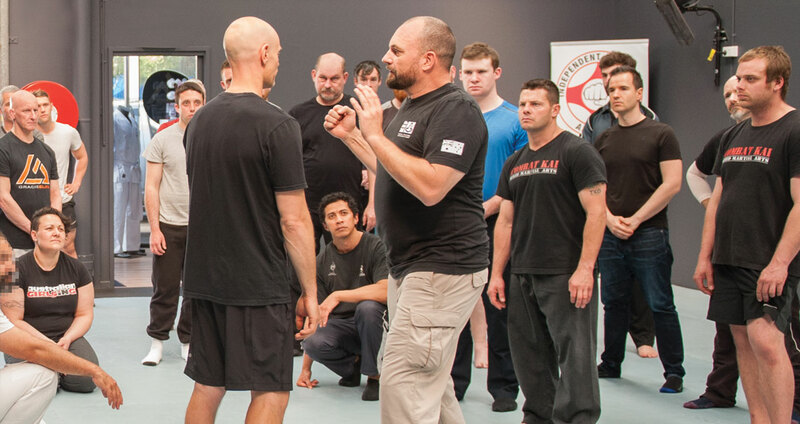 On this course, you will receive close instruction in battle-proven principles and survival tactics that are adaptable to any martial art or on-the-job procedure. The four-hour session covers the key aspects of surviving a violent confrontation: mindset, tactics, legal and moral considerations, and functional, high-percentage techniques. On the Alpha course you will also discover how KEF–IC’s battlefield origins inform everything that you learn. With that in mind, the physical training focuses on the tactical application of predetermined gross motor skills, which are designed for regaining and maintaining the initiative even when in ‘physical deficit’ (meaning, injured and/or exhausted). 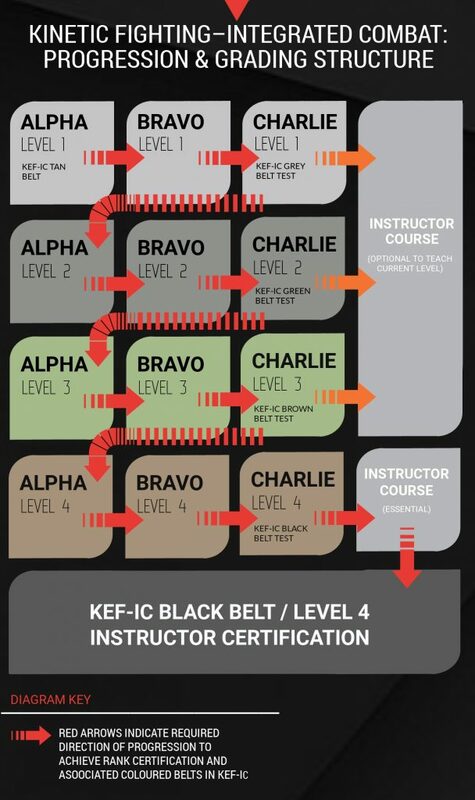 For those who want to be graded or qualify as an instructor in KEF–IC, the Level 1-Alpha course must be followed by Level 1-Bravo. This is the second step before completing the first testing phase (aka Level 1-Charlie). Often run together with Level 1-Alpha (a prerequisite), the Bravo course builds on the Alpha training with four hours of reflex training and drills. With the aim of developing and connecting your skills to form an integrated, effective arsenal, Level 1-Bravo introduces principles of adaptation and free sparring/rolling to enhance tactical capability. You will learn grappling skills applicable to the battlefield, and competitive drills that support tactical aims and develop ‘survivability’. After completing the three Level 1 units, you will be invited to attend further courses in Levels 2, 3 and 4 (instructor level). If you have previously completed the Level 1-Alpha course, its predecessor (Kinetic Fighting P1) or any higher level (P2–4), you will receive a special invitation and/or discounted entry to the new equivalent KEF–IC courses. If instead you are just looking to learn the essentials of self-protection, or to put a more tactical perspective on your current training, you can simply complete the Alpha courses for each level, from 1 to 4. The table below shows these two streams of progression through the KEF–IC training modules: The red arrows indicate prerequisites for completion of every unit in the KEF–IC syllabus, and qualification in the ranks specified; the blue arrows show the alternative path through the essential Alpha seminars only.